Hi everyone. I am finally writing fiction again. It feels SO GOOD to be writing new words in preparation of releasing new works. Seriously! And now – a few fun questions for Dakota. CF: Tell the readers out there a little about yourself. Dakota: Me? Well, there’s nothing really to tell. I live in a tiny town; go to school like every other 17-yr-old and yeah...That’s about it. CF: Is that really all? Dakota: Um, yeah. Okay, well no. That isn’t all. I sorta have weird dreams. A lot. And an occasional panic attack. Maybe even a mental breakdown or two. Okay, fine...I’ll tell you all the truth. My parents took my brother and me into witness protection forever ago because of some crime or something they witnessed. They didn’t tell me my life was a lie. Not until they told me I had to move. That’s all I know about it. CF: Okay, moving on. What do you want more than anything? Dakota: A few days ago I would have said I just want out of this boring town! Me, my BFF Elaine and my boyfriend David (Okay, ex-boyfriend). Now that I’m being forced to leave, now that I know my whole life is a lie...now I just don’t know what I want. CF: What are your thoughts about paranormal activity and psychic phenomenon? CF: Tell the truth Dakota. Remember, I actually know your thoughts on this stuff. Dakota: Okay, fine. I think there is a lot more reality to psychic abilities than most people are willing to admit. In fact [she leans forward to whisper] there are times I think I can see the future. Or make people do what I want them to. I know that makes me sound like a freak. 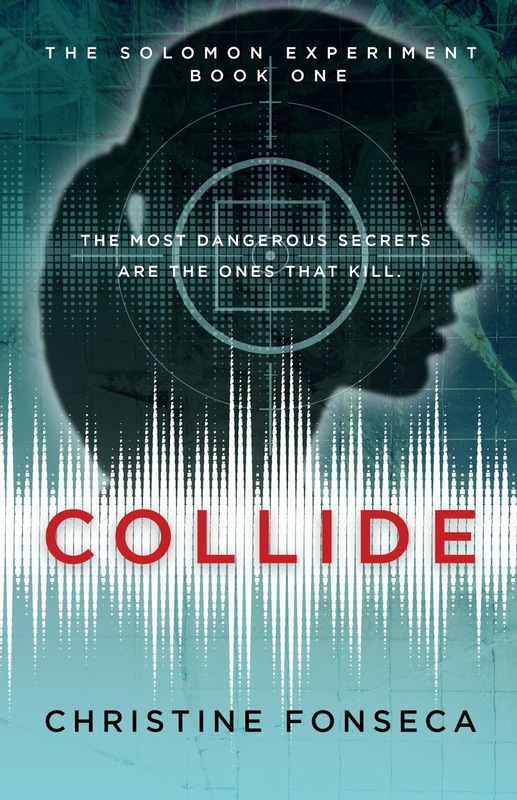 CF: What do you want readers to know about COLLIDE? Dakota: COLLIDE is a YA thriller made for the cross-over, mystery reader. It’s a rollercoaster ride, with tons of action, crazy psychic phenomenon and a touch of government intrigue. Think X-Men meets the Bourne Identity and you’ll have it. Christine and I can’t wait for you to read it and tell us what you think! There you have it, my interview with Dakota about COLLIDE, Book #1 of the Solomon Experiments. Collide is also available in audio format through Audible.com. Be sure to catch me on my FB page on Weds at 12:00pst. I will be doing a live reading from Collide for everyone!